It was quite the fishing season up here at NSLL! A Housekeeping walleye hotspot in East Bay on North Spirit Lake took the hype early, followed up by a spree of 40+ inch pike on Margot Lake. Through the summer the fish didn't skip a beat. Catch and Release towels and Pro Angler hats were presented on an almost rhythmic basis for walleye and pike, with the walleys taking the spotlight. To everyone that fished with us this summer, we hope you had as much fun fishing with us as we did; and we hope to fish with you again next year! With the new 20 foot Yukon working out so well these last two summers for us we are now adding another!! Not only is this boat larger with a couple extra horses pushing her throught that water, but it also cuts through the waves with ease, making those windy days less of a headache... or should I say, backache. Congratulation to the Catch and Release Club of NSLL! Congratulations to our new Catch and Release Club Members and thank you to the members of the past! For the past few years we have done our best to release our larger fish back swimming, and this year the lake gave back. Pro Angler walleyes were showing up in the boats at a pace that even made our guides blink twice. THANK YOU for helping keep our lakes producing, and our fish growing!! We have updated the rate sheet information. Call for availability. Don’t let your favorite spot get away! Watch for your Ontario Outdoor Card renewal. Renew online at www.ontario.ca/fishing and purchase the required license. Requests for deposit letters were mailed to customers who reserved space for the following season. If you did not receive one, please call or email so we can confirm your dates. 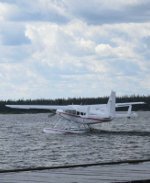 Includes round trip air from Red Lake Ont.